North Korea saw increased sanctions and further international pressure after it launched a rocket on Friday [14th April], an act that has been described as "provocative". The launch of the rocket was intended as a propaganda boost for the country which has seen itself become increasingly isolated. But shortly after launch the rocket disintegrated, falling into several pieces into waters 165km west of the South Korean capital, Seoul. It was a setback and an embarrassment for North Korea as it held celebrations to mark the 100th anniversary since the the birth of the state's founder, Kim Il-sung. As thousands gathered in Pyongyang the UN Security Council criticised the rocket launch saying it was a clear breach of two Security Council resolutions. The UN statement, read by the current Security Council chair, US ambassador Susan Rice, said the launch broke UNSC resolutions 1718 and 1874. Tough sanctions had already been imposed against North Korea following earlier rocket launches in 2006 and 2009. And the latest arrogant display was not welcomed by the US which cancelled food aid after the announcement of the proposed test last month. In February, North Korea had agreed to a partial freeze in nuclear activities and a missile test moratorium in return for US food aid. But this deal now lies in tatters. "I wish we could find a way not to paint North Korea further into the corner they're busy painting themselves into," Aidan Foster-Carter, Korea analyst at Leeds University, told the BBC. "We need to engage with them and draw them out but they have again made that harder." Meanwhile China has called for calm and for the international community to show restraint. While expressing concern over the launch Foreign Ministry spokesman Liu Weimin said China would continue communication with all sides. Zhang Xiao'an, vice-president of the United Nations Association of China, conveyed her worry over the launch saying, "China is concerned that DPRK-US relations, which had eased, may be dragged into a new vicious cycle and could even lead to an arms race." As North Korea backed itself into a corner, Burma [also known as Myanmar] was showing clear signs of opening up. A country that like North Korea was once isolated has made tentative steps in electoral reform. It has brought a small break through for international relations with promises of economic and business deals if the country continues with reforms. As North Korea launched rockets, the British Prime Minister's convoy was showered with water as the country marked the water festival. 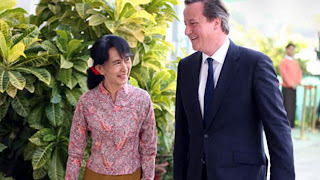 Speaking during the first official visit for a British Prime Minister since the country gained independence in 1948, David Cameron said economic sanctions against Burma should be suspended in recognition of the changes taking place in the country. Ruled for almost half a century by a military junta that stifled almost all dissent and wielded absolute power, Burma has held elections which gave former political prisoner Aung San Suu Kyi a seat in parliament, though it is more a token role in a government still dominated by unelected generals [BBC]. While Burma still has a long way to go in convincing the world it has changed, the situation there has very much improved from just a few years ago. In 2007 protests against the military junta in Burma saw a heavy clampdown which resulted in the deaths of dozens and the arrest and beating of Buddhist monks [BBC / CNN / tvnewswatch: Myanmar - 5 dead as troops shoot protesters / tvnewswatch: UK - Censorship at Burma protest / tvnewswatch: Aung San Suu Kyi released].